Following a sharp decline in the number of visitors in 2016, a year that included a series of terrorist attacks and a failed coup, Turkey's tourism industry has recovered in 2017 with a continuous rise in the number of foreign tourists coming to the country.The number of foreigners visiting Turkey in the first 11 months of this years was up over 27 percent compared to the same period last year, according to the Culture and Tourism Ministry Friday. 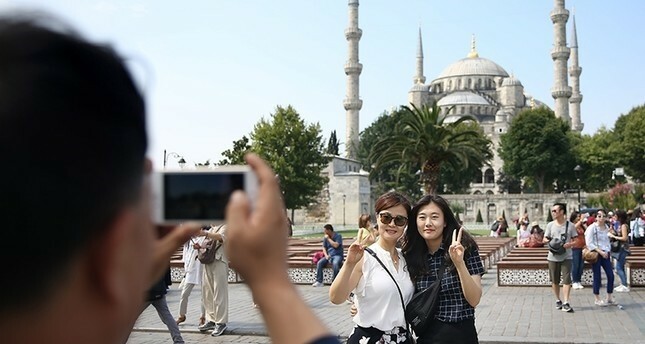 An increase in tourism has continued according to the ministry's border entrance and exit statistics, the ministry said in a statement.Turkey saw around 30.7 million tourists from January to November of this year, the ministry said. The number of foreigners visiting the country increased 27.68 percent in the first 11 months of this year compared to the same period last year. Looking at monthly statistics, Turkey welcomed around 1.65 million tourists in November, an increase of 22.13 percent compared to the same period last year. Russians again led the way with more 4.65 million people coming to Turkey in the first 11 months of 2017, followed by Germans with around 3.5 million and Iranians with more than 3.3 million. On a monthly basis, Iranians ranked high with around 196,393 tourists visiting Turkey in November, followed by Georgians with 179,429 and Bulgarians with 148,111. July had the highest number of visitors with around 5.1 million tourists traveling to Turkey. It was followed by August with 4.6 million. Official data also showed that most of the visitors, 22.4 million, arrived by air, while 7.6 million traveled by rail and around 750,000 by boat. In the first 11 months of the year, Istanbul ranked first in terms of the border gates through which visitors entered the most, followed by Antalya, Edirne, Artvin and Muğla. In November, entries were mostly made through the border gates in Istanbul, followed by Edirne, Artvin, Antalya and Ağrı. The figures also showed a gradual recovery following a resumption of chartered flights from Russia and waning terror attacks. Some 25.3 million foreigners entered the country in 2016, compared to 36.2 million in 2015. Tests for the production of Turkey's first domestic hot air balloons are being carried out in Cappadocia, famous for its unique moon-like landscape, underground cities, houses carved in rocks and hot air balloon tours, according to a report in the Dünya daily. With the completion of prototype tests, production of the domestic hot air balloons is expected to start in September of next year, the report said. Local producers are undertaking hot air balloon production due to the difficulty of supplying spare parts for imported hot air balloons, theirmaintenance and repair costs. The head of the Cappadocia Balloon Care Center Quality, Mustafa Ağa, said they initiated the domestic hot air balloon project in cooperation with Nevşehir Hacı Bektaş University, Small and Medium Enterprises Development and Support Administration (KOSGEB), Konya Ovası Project Directorate, Otonom Technology at Bilkent Teknopark and academics from Middle East Technical University and Uludağ University. He added that they aim to benefit from KOSGEB's support after the completion of their research and development (R&D) projects. Ağa said Turkey not having its own hot air balloon production is what prompted them to carry out the project, adding that another reason that directed them to it was that the spare parts needed for the repair and maintenance of imported hot air balloons. Explaining that there were 25 hot air balloon companies in Cappadocia, Ağa said: "Our products will be made to order. Customers will be able to choose color, capacity, material and logo of the balloon." Ağa said the prices vary by balloon size from 50,000 euros to 120,000 euros. The cost of the hot air balloons that the company will produce in the domestic market will be 30 percent cheaper than their equivalents in Europe. "One of the most important part of our project is to manufacture the type of fabric necessary for hot air balloon production. The fabrics produced by the company will also be exported." Noting that these fabrics are not produced in Turkey, Ağa said European hot air balloon manufacturers import the fabrics they need.